"Pocahontas Grain Elevator I" Limited Edition prints are available in the original painting size of 13.25" W x 17.25" H, $35. Click on photo to enlarge. Decades ago, my mother gave to my husband, Bill Shimon, a different, but almost identical painting of the Pocahontas grain elevator. I call Bill’s version/painting Pocahontas Grain Elevator II (Pocahontas II for short). As mentioned, until last September, I thought Mother’s snapshot was of the painting she gave to Bill. How excited I was to learn from Reigelsbergers that they had the “snapshot” painting of the Pocahontas grain elevator. Both paintings are now displayed in Bill’s and my home. Because the two Pocahontas paintings are somewhat similar, I am pointing out two main differences between the paintings. "Pocahontas Grain Elevator II" prints are available in two sizes: Small (Limited Edition, 10" W x 12.3" H, $25) and Large (17.9" W x 22" H, $50). Click photo to enlarge. 1. 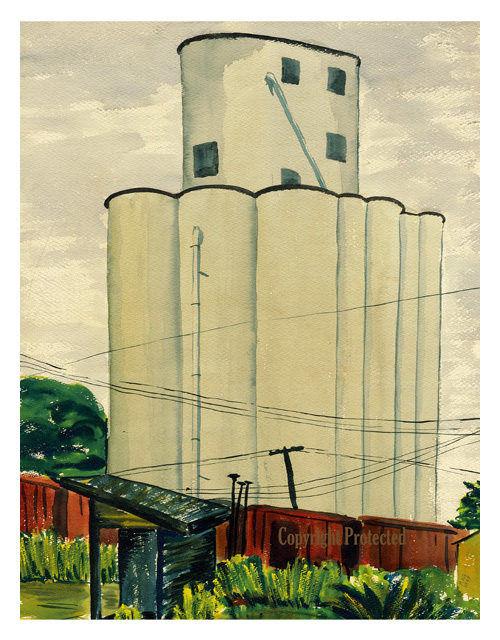 For Pocahontas Grain Elevator I, Mother used more muted watercolors. Pocahontas Grain Elevator II includes more vibrant colors. 2. The second main difference is that the original size of Pocahontas I (the more muted) is much smaller than the original of Pocahontas II (the more vibrant). To inquire about prints, please contact me (Louise Gunderson Shimon) at mariongundersonart@ gmail.com, or contact Mona at Wild Faces Gallery in Rolfe, Iowa (712-848-3399). All profits from sales of the prints will go to the Rolfe Public Library, where Mother worked for thirty-five years. Seven additional images of Mother’s watercolors will be posted over the next two weeks. * This photo is posted with permission granted by the Pocahontas County, Iowa, Historical Society. 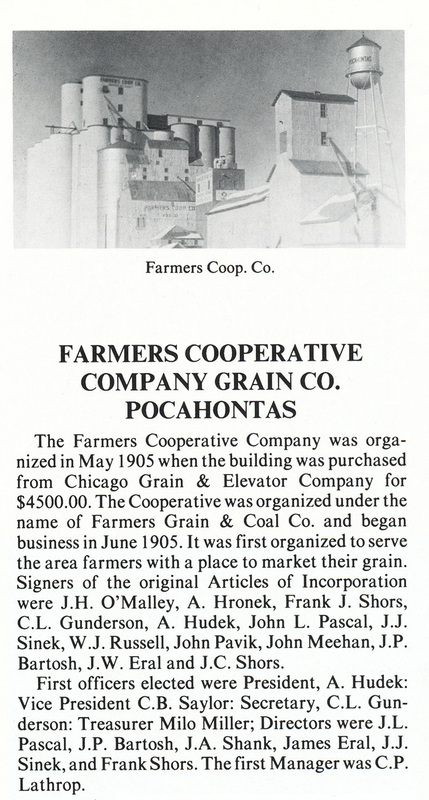 It is from page 60 of the Pocahontas County, Iowa, History, copyright 1982, Pocahontas County Historical Society, Rolfe, Iowa. 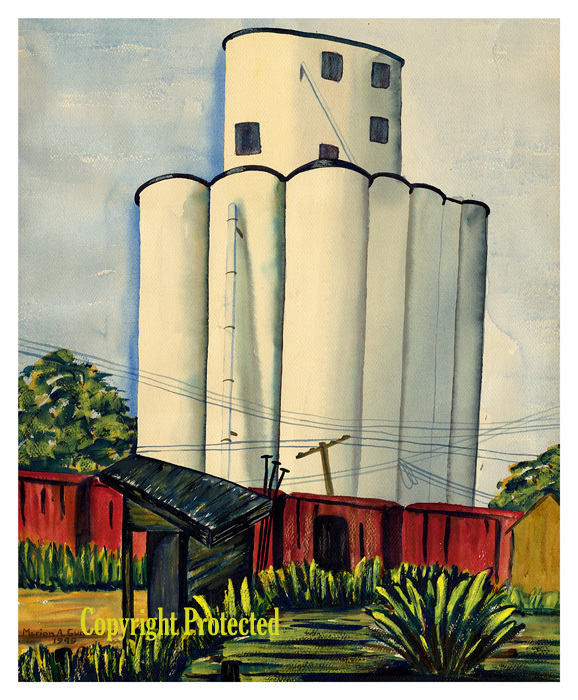 This entry was posted on June 16, 2009 at 9:09 pm and is filed under Grain Elevator, Iowa, Marion Gunderson, Pocahontas, Pocahontas Grain Elevator I, Pocahontas Grain Elevator II, Watercolor image. You can follow any responses to this entry through the RSS 2.0 feed. You can skip to the end and leave a response. Pinging is currently not allowed. Great explanation of how you came to know the familiar version . . . and now the “new” version! Also, nice to see the differences noted.